No shrinking violet... Capt. 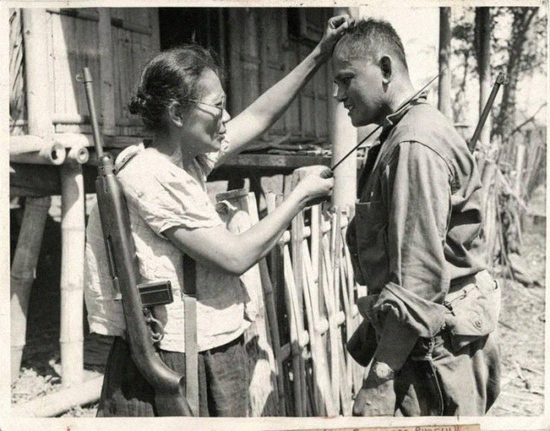 Nieves Fernandez with an M1 Garand on the right shoulder and her weapon of choice - the Machete (Bolo or Sundang). Discovered this provocative photo of the only known female guerrilla fighter named Captain Nieves Fernandez, a Leyteña, during WWII. With this, that epithet of the Warays being “ma-isog” (fearless) came to the forefront of my brain once again. The photo ca. 1944 taken by a photographer named Stanley Troutman, shows Captain Fernandez demonstrating to an American GI how she eliminated Japanese soldiers with the aid of a machete during the occupation. Fernandez was also a school teacher and fought south of the Tacloban area. Reports indicate she lead a guerrilla troop of 110 and their kill claims were at 200. It was said that she had a method to her assassinations that was sure and swift, she aimed for the carotid artery and inner jugular vein which are main blood suppliers to the brain; the enemy would have felt pain at first but death came almost instantaneously, a sort of merciful killing (if there is such a thing). She fastidiously trained her troop in hand to hand combat, makeshift weaponry and helped barrios and was instrumental in freeing comfort women to safety. Wow. That is bad A.
I am certain that Kapitana didn't start off as a macehete-weilding lass in Leyte and given the choice, I bet, she would have just been gratified simply with imparting education to the younglings but alas, desperate times… Her notoriety was borne out of dire circumstances and the Japanese issued a bounty for her head to the tune of P10,000, I am of the opinion that her "isog-ness" wasn't misapplied. Would post script with this though: the Waray’s fearlessness works best in pertinent matters, when the need is for the many but not for one’s own self-interest and certainly not for insolence's sake. May we all take that to heart.